Caltha palustris – Dig Delve – An online magazine about gardens, landscape, growing & making. 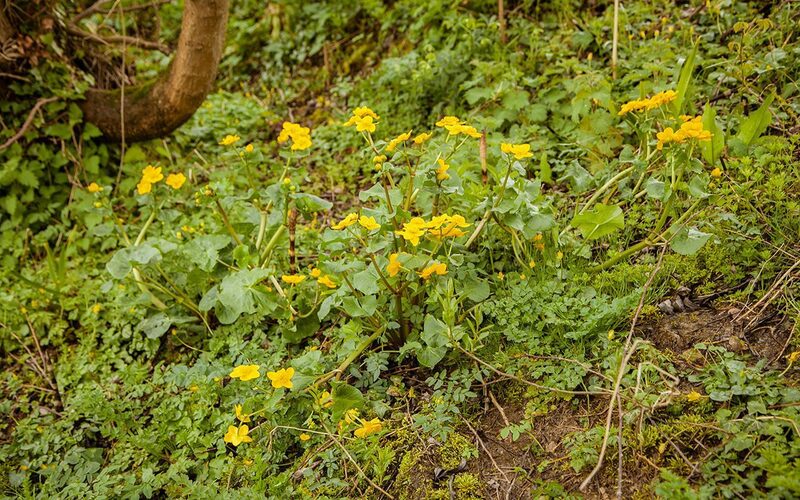 Stirring early from the dark mud, whilst almost everything else is sleeping, come the marsh marigolds. They were with us at the beginning of March this year, alone and lush and startlingly gold for their precociousness. 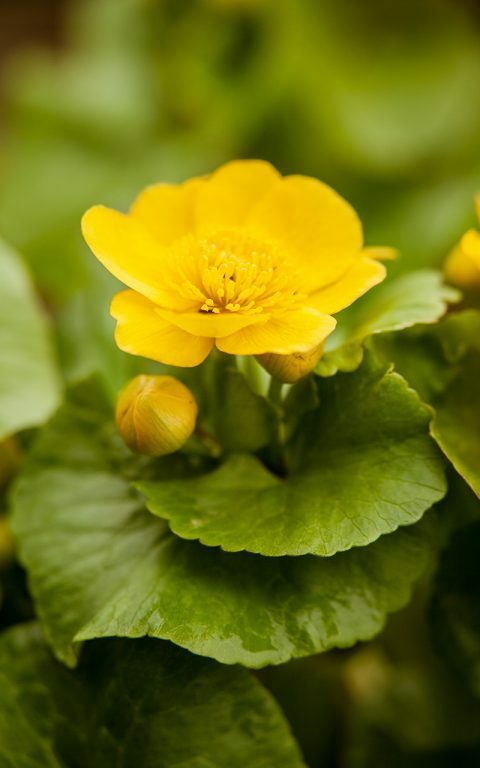 Taking over just as the snowdrops are dimming, Caltha palustris is more than welcome when you are pining for momentum, their cupped blooms glossy and facing upwards to catch sunshine. Their growth is fast and out of kilter with the slowly waking world around them, their limbs arching out and splaying away from the rosette of lush foliage. Fat buds weigh the long flowering limbs, which hover just above water as if they feel their own reflection. I started our colony here with a little clutch of plants that our neighbours gave me from their wet alder woodland. The deer population – or their passage through the woods – must have changed since then, because the colony has diminished through increased grazing. Where there is a decline in one place, there is often a countermove in another and I have made it my business to give them a place here at the head of the ditch, where a constantly running stream animates the crease between our fields. When we came here the ditch was just that, a place that was fenced off to keep the cattle from getting lost in the mud and where bramble had taken over from barbed wire. We have cleared it since then, letting the hazels grow out and uncovering a surprisingly pretty rivulet of water that sparkles when it is free of growth in the winter. Four years ago I planted a batch of 40 plugs, which arrived from British Wild Flowers just as the winter was turning to spring. Marshland plants and aquatics are best planted with the opening of the growing season rather than at the close, so that their roots can take advantage of soil that is rapidly warming rather than doing the opposite in the winter months. Planting plugs is always easy with a thumb sized knot of roots easily inserted with a dibber, but you have to have faith if you are introducing them into a ‘natural’ situation, for in no time the plants are overwhelmed by the growth of established natives and you loose them from sight for the summer. I followed the mud and the smell of dormant water mint as I planted, pushing the plugs into soil that was almost liquid and avoiding the areas that I could see would dry out as soon as summer came. 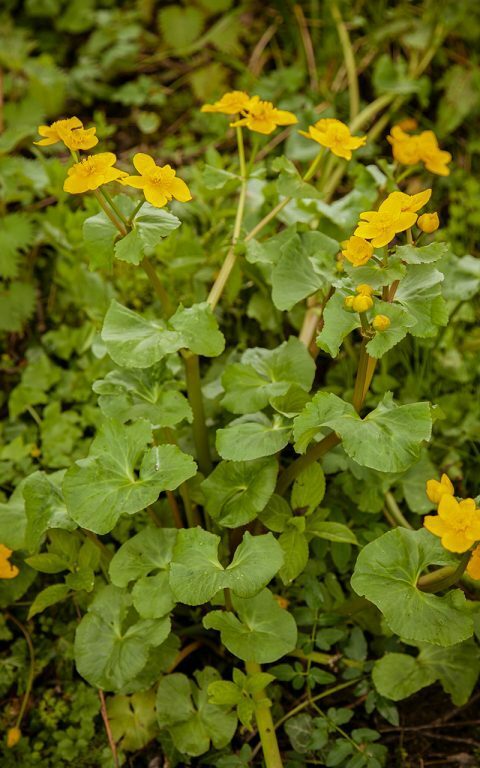 Caltha will grow in shallow water too, but the margins that maintain constant moisture are their preferred domain. They are surprisingly tolerant of competition and, to prepare for it, their early start means that they have set seed and the rosette has fed all it needs to before being plunged into shadow of wild angelica, meadowsweet and hemlock water dropwort. In summer they go into a resting period, the lush foliage of spring collapsed but not dormant, taking in all it needs to keep things ticking over. The spring after planting I followed the watercourse to retrace my steps from the year before. Given the fecundity of the summer growth here, it came as no surprise that just one plant had made enough energy to flower, but to my delight I found the rest of the 40, which in three years were all flowering and tracing a line of early gold, providing first forage for the bees, whose hive sits on the ground immediately above them. 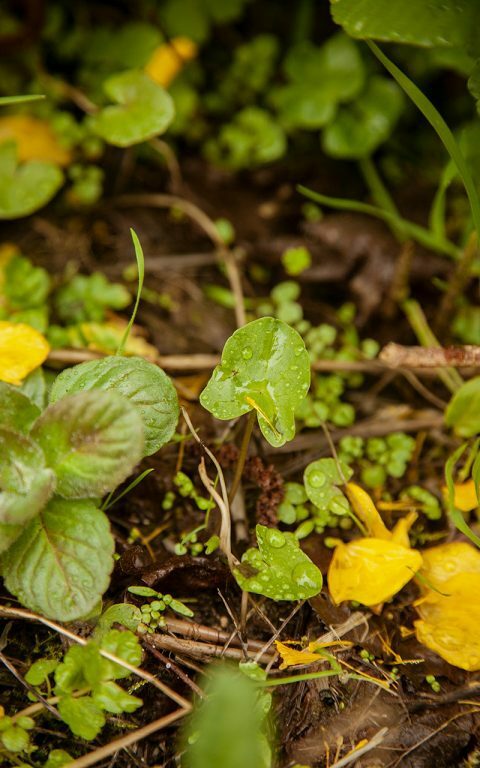 This year I have found the first seedlings, which have tucked themselves close to their parents in the mud where the conditions are controlled by the lush growth above them. The seed, which is heavy, germinates where it falls and does not move very far, but I imagine if it falls into water, it will wash and tumble a fair distance before finding purchase. To help in this process, and now that the youngsters are proof of the fact that they have found a niche, I have extended the colony downstream. Another forty plants went in this winter, just as the first signs of growth were showing, stopping and starting so that they look like they have found their own way in the watery margins. 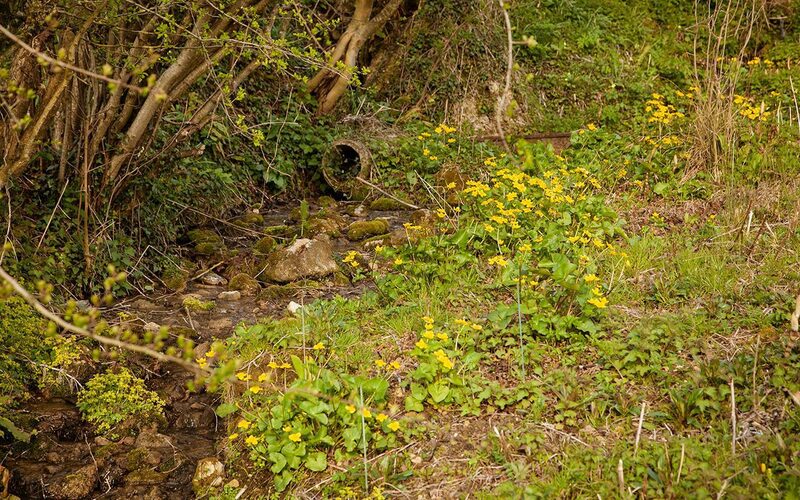 A bridge now crosses the water where we connect from the garden to the rise of The Tump and I increased the Caltha to either side here so that we can look down on them and meet their upward-facing gaze. Looking downstream from the bridge, I can already imagine the colony extending its reach still further, finding the hollows and the wet puddles of mud that provide it with the opportunity of an early start and us the joy of seeing these wild plants naturalise.